The new iPhone 3GS (the “S” stands for speed) was introduced today along with the next iteration of the iPhone OS 3.0 to be released June 17. 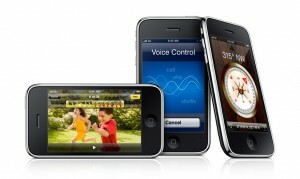 On whole I like what I read about the new phone and definitely can’t wait to upgrade my 3G to OS 3.0. It’s a shame that I can’t upgrade m network from AT&T to someone else. On of the things that became very apparent is that AT&T is holding the iPhone back. Finally Apple announced that the new operating system will support multimedia messaging – with the new phone adding video to the service. But AT&T will not add MMS until late summer. Even worse, there are rumors that AT&T might charge more for the service. Of the networks that were listed as supporting tethering, AT&T wasn’t one. If you’re not familiar, tethering allows you to connect your laptop to the internet using your phone’s connection. The problem is that AT&T can’t figure out what to charge for the service. I don’t expect that this would be free, but there’s no reason for AT&T not to know by now how to provide this service to their customers. As far as the new phone, I think it seems to be the natural evolution of the iPhone 3G, adding video recording, a 3MP autofocus camera, voice control, gads of speed, increased battery life, and a load of other improvements. While the difference between the original iPhone and the iPhone 3G was massive and important to the usability and usefulness of the device, the difference between the 3G and 3GS seems more about refinement – and that’s what was needed. It’s also important to note that the iPhone 3G is still available at the drop dead low price of $99 with a two-year contract. Of course you’re still stuck with AT&T as your service provider, but the phone is worth it if you’re in the market for a smartphone. I’m not going to run out and buy a 3GS – I’ve still got a year on my contract and I truly believe the iPhone is the best phone I’ve ever owned, and the upgrade is all I need. Of course I can’t wait to see what Apple has in store for us next year when they release the next iteration of the iPhone.